Nearing the three-and-a-half decade mark, Spirit of the West continues to rock audiences with their original and potent blend of Folk, Celtic, Rock, Pop and Punk. The band that began in 1983 as an innocent trio of acoustic guitar, flutes and bouzouki is now a musical and performance powerhouse that features 6 musicians and dozens of instrument changes in a night’s worth of timeless and beloved songs. 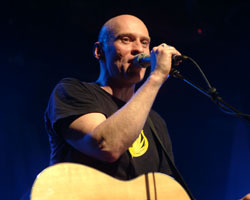 With 13 albums to their credit, five of them gold and three platinum, a history of extensive touring throughout the western world, and the authorship of a drinking song (”Home For a Rest”), so well known and loved that it is often called ‘Canada’s unofficial national anthem’, Spirit of the West’s legacy has grown to legendary status. Fan favourites such as ‘And if Venice is Sinking’, ‘Save This House’, ‘Puttin’ Up with the Joneses’ and the quintessential drinking song ‘The Crawl’ have etched themselves into the soundtrack of youth of several generations of Canadians. 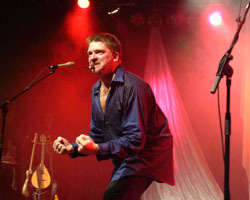 In recognition of Spirit’s long career they have been inducted into the Hall of Fame of the Western Canadian Music Association, have received the National Achievement Award from the Society of Composers, Authors and Music Publishers of Canada, and were, in 2014, presented with a star in Vancouver’s ‘Starwalk’, located on Theatre Row on Granville Street. 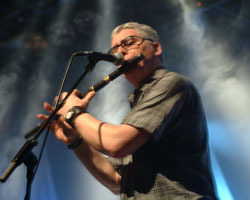 The band consists of John Mann (vocals); Geoffrey Kelly (vocals, guitar, flutes, whistles, bodhran); Hugh McMillan(vocals, basses, nearly all other stringed things on Earth); Tobin ‘The Gull’ Frank (basses, accordion, keyboards); Matthew Harder (vocals, guitars) & Vince Ditrich (vocals, drumkit, percussion, management, refreshment coordination). Spirit enjoys a brilliant technical crew that is well worthy of mention: Chris Hibbins (FOH Mix/Tour Management) & Andre Arsenault (Stage Management/Guitar Tech). 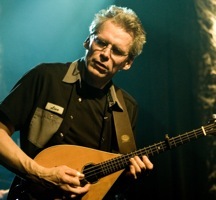 Hugh McMillan – Multi-instrumentalist. Hugh is capable of playing practically anything with strings on it. He is a producer, composer/arranger session musician and audio engineering nerd, as well as a bit of a mad scientist. Quick to hand out dietary supplements to those who look a bit peaked. 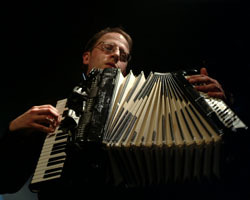 He plays concerts with erstwhile troubadour James Keelaghan and Chilean-Canadian wildcat guitarist Oscar Lopez from time to time, and can be heard on CDs from Sarah McLaughlin, The Town Pants, The Irish Rovers, James Keelaghan, Oscar Lopez and is currently organizing boxes of notes to coalesce into a collection of his own material. Hugh is the only member of Spirit of the West who can reliably read a map. Vince R. Ditrich – Drums, percussion, vocals. Although well known for his comedic onstage antics, Vince has appeared in concert and in the studio with artists the likes of Sue Medley, Long John Baldry, Doug & the Slugs, Great Big Sea, Oscar Lopez, James Keelaghan, Mae Moore, and many others. (He is currently combing his CV for reference to ANY artist from the 21 century). Vince manages and acts as producer for House of Doc, Quinzy, and also gets to hold the tiller for Spirit of the West. He recorded a solo CD called Supertonic in 2001 and is still paying for it. Artist Management has taught him to type with his thumbs as effectively as a teen. He coordinates all refreshments for the band and has been known to instigate outrageous hotel upgrades.